Several players have started to arrive in Argentina to join the national team. 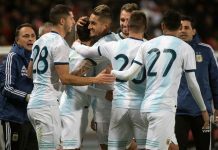 Tottenham Hotspur trio Erik LAMELA, Paulo GAZZANIGA and Juan FOYTH were among the first few players to land in Argentina ahead of the team’s first friendly match against Mexico on Friday. I just hope lamella puts his NT Career back on track against. He is still 26 Only. So age is in his favor, Just stay fit. He could be a really useful player for us someone who can play in various positions in midfield, Lanzini is another one who could also be a useful player. Lets see whether Scaloni prefers any Young Goal Keeper or will he stick with Romero, We know what Romero brings to the table. Lets test others too at least in 1 match. Which i think Scaloni will do. Yeah Licha is quickly establishing himself as the best defender in the primera, maybe even better than Barboza, but Barboza’s been proving himself for years now and Licha just started establishing himself so I’m ok with him not being called up for the time being. The 2 of em make a hell of a pair though and I really hope that Scaloni has atleast taken notice. Although, I hate Real Madrid and Manchester United, I can’t ignore the work of Santiago Solari. Although, I he hasn’t coached in a big game yet, he seems to be very attacking minded coach. 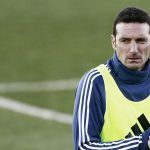 I am really hoping that Real give him a short-term deal only til end of the season, so that he could be in the running for NT coach position. But the rumors coming out Spain are saying that Los Blacos are about offer him a 3 year deal. I like what Scaloni is doing a good job but those who listened to Solari interviews, he talks and demands high-intensity football from his players like Sabella. The NT has never really produced impressive attacking football with the 3 coaches. In my opinion, the reason players like Messi, Aguero and Dybala find it hard to perform at their level best for the NT is beacuse there is of the lack of grit, balance, co-ordinated offense and intense off the ball mobility from the midfielders and defenders. And we can see how most players’ performance declined dramatically after 2014 World Cup. And that is the reason why it’s my wish that he’s available next summer after the Copa. BTW, the last Argentina coach to the WC experience was Carlos Billardo. So Idon’t think experience counts over good sound coach. No way solari is not leaving real madrid, either he will coach or assist in real madrid, Argentina should hire gallardo or Ricardo Gareca or tata martino as a short term coach till copa. 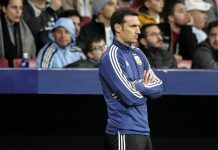 On the other hand only 5 matches are left before copa, not enough time to experiment and scaloni s doing same thing as sampoli did, he is still experiment with team he should have called messi and should move further with a proper idea and tactics keeping in mind next copa america. But i doubt scaloni doesnt know what is he doing. Tapia is a brainless guy , atleast he should arrange friendlies with some big european nations. off topic: congrats to Santiago Solari. After 4 wins out of 4 games he will remain coach of Real Madrid. 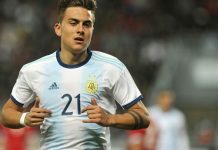 Tagliafico – Pezzella – Foyth – ? Attacking players all great playingmaking, dribbling, etc and most aren’t afraid to shoot outside box. Romeo or Armani will be keepers but I want to see Gazzi play.. 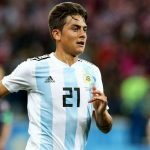 I remember seeing Lamela play for ARGENTINA U-20 WC in 2011, cocky, arrogant and so full of himself and more of the same when he played for ROMA, a punkass that needed to be slapped!! Lamela has come a long way from those days and I hope we finally get to see what we’ve been waiting for >>>quality player that helps ARGENTINA WIN. They are hungry for money, they do this at the expense of the players. I isn’t fair. I still don’t see the logic playing the same team twice in the span of 4 days, but whatever. That’s AFA for you! One friendly against Mexico and then another aainst the USMNT or Bolivia, Chile, Peru or any other national team would make more sense, but two friendlies against the same team in 4 days?